In the bowl of an electric mixer fitted with a dough hook attachment, stir together yeast and milk. Let stand until yeast is dissolved, about a minute. Add flour, 1/3 cup sugar, salt, and eggs; mix on low speed until dough comes together, about 1 minute. Continue mixing on low for another 2-3 minutes more. Add butter, a few pieces at a time, adding only once the butter is fully incorporated and dough is soft, 5-6 minutes. Remove dough from bowl and wrap tightly with plastic wrap. Refrigerate at least 6 hours, but no more than 15 hours. Lightly flour a baking sheet and set aside. On a well-floured work surface, roll out dough into a 12 inch square about 1/2 inch thick. Using a 3-1/2 to 4 inch round biscuit cutter, cut out 9 doughnuts. Transfer to prepared baking sheet and cover with plastic wrap; let stand in a warm spot until they’ve doubled in height and feel soft and pillowy, 2-3 hours. Fill a large heavy-bottomed saucepan with oil to a depth of 3 inches; heat over medium-high heat until it reaches 350 degrees on a deep-fry thermometer. Working in batches, place doughnuts in the hot oil, taking care not to crowd them. Fry until golden brown on one side, 2-3 minutes; turn and continue frying on remaining side until golden, 2-3 minutes more. Using a slotted spoon, transfer doughnuts to a paper towel-lined baking sheet until cool enough to handle. Place remaining cup of sugar in a small bowl. 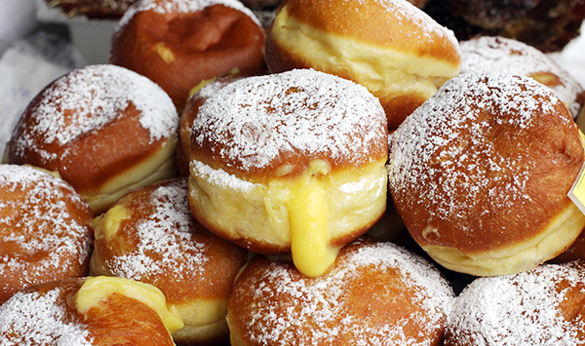 Toss doughnuts in sugar, one at a time, to evenly coat. Return doughnuts to paper towel-lined baking sheet to cool completely, 30-40 minutes.